What a clever rendition of the classic nine patch block. Note the variety of cream white prints used as the background fabric. The quilt top was made by the local Mennonite quilt designer Connie Lapp and was quilted by her mother. Wow what a great combination of rose colored fabrics! 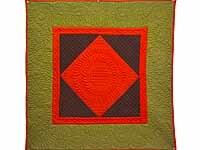 A quilt that will loved by any girl whether 4 or 64! Top made by Connie Lapp a young local Mennonite quilt designer. 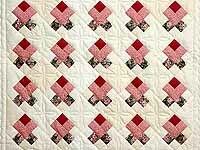 Nicely quilted by her mother. 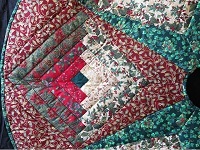 Exquisite quilt with postage stamp size patchwork pieces. The tan background is called Paper Bag here in Amish Country. Note the extraordinary care taken with the piecing. 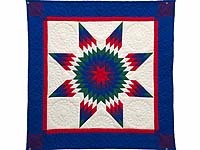 The quilt top was made by Connie Lapp, a local Mennonite woman, and the quilting was done by her mother. 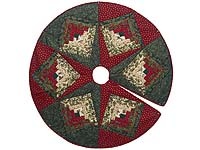 May be used as a throw, wall hanging or a generously sized crib quilt! 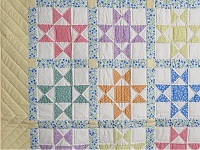 A classic hand made baby quilt! 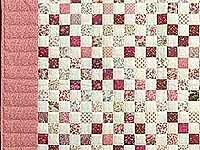 A wonderful collection of lovely pastel print fabrics and a well made, pleasing patchwork design. This crib quilt is generously sized. Notice the pretty print fabric used on the back of the quilt. 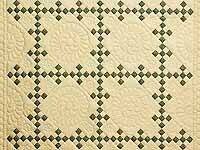 Beautifully hand quilted. Made in Lancaster County, Pennsylvania by an Amish woman. Sure to be a treasured heirloom! Classic Amish Center Diamond design with bright Midwestern Amish coloring. The colors are incredible! Covered with amazing hand quilting! Top made by an Amish woman from northeastern Indiana and hand quilted by an Amish neighbor. Includes a sleeve for a hanging rod. A rare treasure! A fantastic finishing touch for your extraordinary Christmas tree! Superb fabrics and excellent workmanship. Notice the fine quilting. Center hole is about 4 to 5 inches in diameter. Made in Lancaster County, Pennsylvania by an Amish woman. Would also make a great table throw.